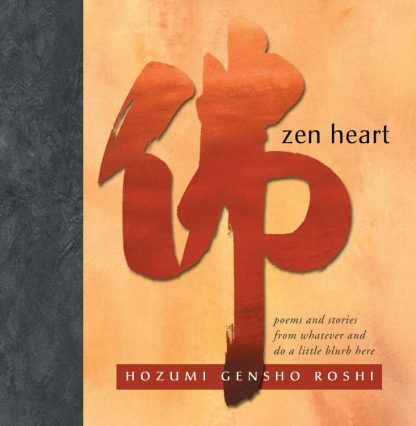 This collection of 28 teachings by Zen Master Hozumi Gensho reads like an eloquent Dharma chapbook complete with original works of Zen calligraphy. Hozumi Roshi gently leads the reader through some of the major themes of Buddhism as presented in the Heart Sutra, the Mumonkan (Gateless Gate), the Hekigan-roku (The Blue Cliff Record), and other Zen texts. Ancient and modern masters are also cited along with passages from the Kansan-shi (Poems from Cold Mountain) and the Nanporoku (a handbook on the Way of Tea). Hozumi Roshi's work has long been available in Japan and Germany. This is the first time his teachings are available in English. Readers are sure to be inspired by Hozumi Roshi's simple but penetrating texts to discover their own Zen Hearts. Hozumi Gensho Roshi was born in 1937 and entered the Tokoji Zen temple in 1944. For 12 years he practiced zazen under the guidance of Yamada Mumon Roshi at the Shofukuju monastery. He is currently vice dean of religion faculty at Hanazono University and directs the Tokoji Zen temple in Kyoto, Japan, where he lives.